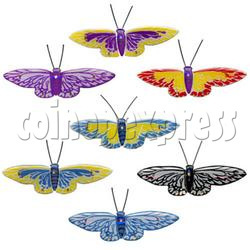 A jewelly butterfly is designed with LED lights. Once mobile phone receives signals or calls, it will flash beautiful lights. Besides a slim string assembled in head of the butterfly for hanging on your mobilephone, there is also a safety pin attached on back of the butterfly which you can put on clothing or bags. Come with a mobile phone strap and a safety pin. Minimum order quantity is 3000 pieces.